Here is a Zome model of the regular four-dimensional compound of five 24-cells. This model alone singularly demonstrates the unity of many Zome models of four-dimensional geometry. It exhibits relations between the polychora with the same symmetry as the 600-cell (in particular the 600-cell and the first stellation of the 120-cell), projections of the 24-cell, projections of the 16-cell, and triality. This particular model is distinguished as well because it was rendered with Scott Vorthmann's amazing software vZome before the physical model was built. 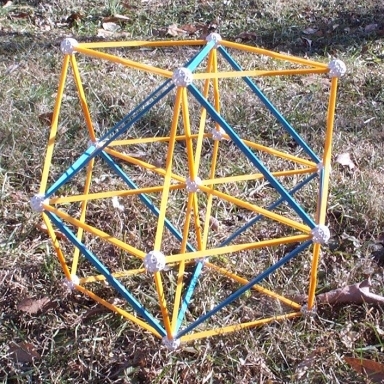 The first Zome model uses only yellow and blue struts and has pyritohedral symmetry. (This is the smallest 3-space symmetry group which contains all the rotation symmetries of the regular tetrahedron and a central involution; it acts on a typical pyrite crystal, thus explaining the name.) 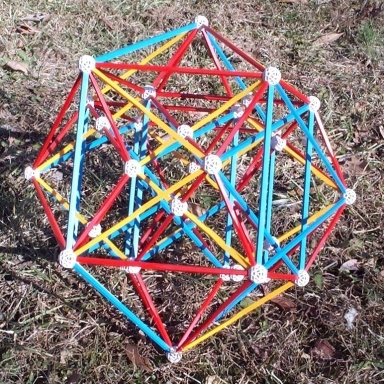 The second Zome model uses red, yellow, and blue struts and has a characteristic axis of trihedral symmetry, sharing the same symmetry with a trigonal antiprism. For this reason, one may describe this as the "prismatic" projection. Notice that the second model also possesses 12 "false" intersections between pairs of red and yellow struts. It is a remarkable fact that these two projections are related. 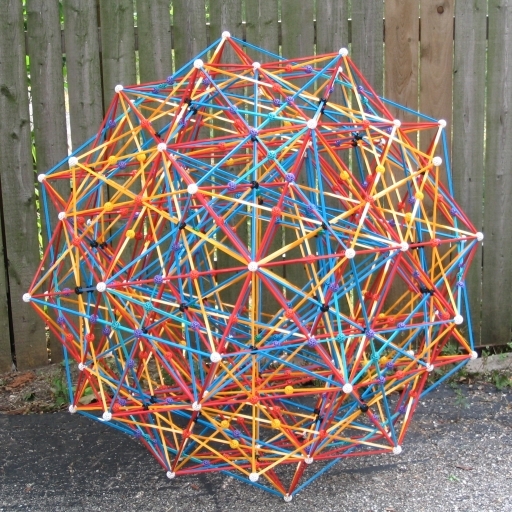 The Zome model of the compound of five 24-cells purported here is (essentially) the union of one of the pyritohedral projections and four copies of the prismatic projection. The symmetry axes of the four copies of the prismatic projection are aligned with the 3-fold rotation axes of the pyritohedral projection. 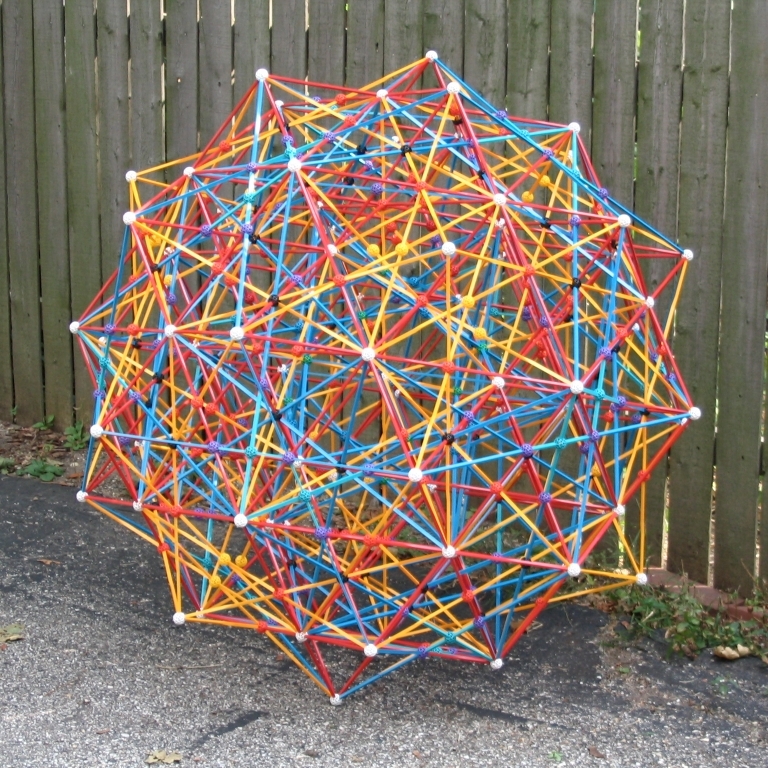 It is difficult to see this in the photograph, but the Zome model of the compound has pyritohedral symmetry. This compound is inscribed in the 120 vertices of the 600-cell, represented by white balls in the Zome model. 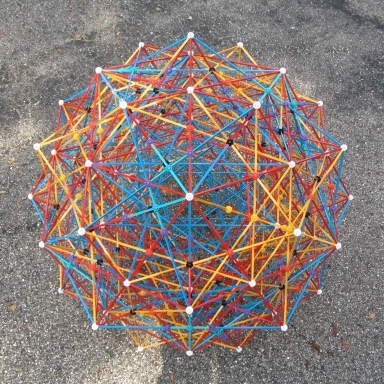 As is well-known, this configuration of 75 Zome connector balls has icosahedral symmetry. However, this Zome model has only pyritohedral symmetry, so some of the usual symmetry axes of the Zome model of the 600-cell are in fact "false" axes. Thus, even though one can still find the symmetrical alignments of balls that one can find in the 600-cell, these may not represent symmetry axes for this model. There are only 7 axes which are retained from those of the 600-cell. Four of these are the axes of the prismatic projections of the 24-cell, and the other three are the 2-fold blue axes of the pyritohedral projection. Notice, if you can, that each of the 4 trihedral axes of the model contains an assembly of yellow struts representing edges of the pyritohedral projection of the 24-cell. As has been observed, the compound of five 24-cells has only 120 vertices. However, one can quickly check that the model uses quite a few more than 120 connector balls. This is due to the high number of false intersections between the 480 projected edges. Notice already that the prismatic projection of the 24-cell has 12 false intersections, and naturally these are all present in the Zome model of the compound. Moreover, there are false intersections between edges of different 24-cells. In fact, one may partition all these false interesections into at least three different types. The false intersections of the first type, of which there are abundantly more in number, coincide with the vertices of the Zome model of the 120-cell. There are precisely 24 of the next type, where two blue struts bisect each other, just as they do in 60 false vertices of the Zome model of the first stellation of the 120-cell. Finally, there are 12 false vertices which coincide with the "genuine" vertices represented by white connector balls. H. S. M. Coxeter. 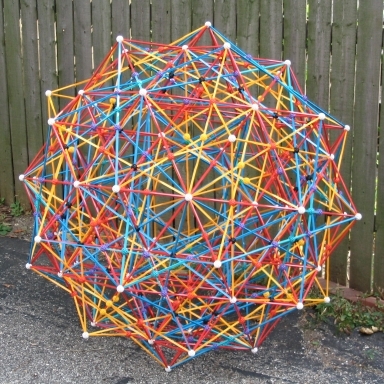 Regular Polytopes. 3rd ed. Dover Publications Inc., New York, 1973. The Compound of Fifteen 16-Cells.